Oh right, the Hawks don’t know how to ease themselves into the playoffs in the shallow end, as this marks the 4th straight year the Hawks have gone to OT in R1G1, and the second straight year it’s been a mult-OT game. Why do things easy? Isn’t this more fun? Rarely will you see a playoff game swing from one side to the other so violently so quickly. The Preds, at least about halfway through the 1st, took this one over and put up three. The Hawks tightened everything up in the 2nd and were all over Nashville in the 2nd. The Preds were slightly better in the 3rd and first OT, and the Hawks waited them out. Of course, after we said this was two disciplined teams with anemic power plays, this turned out to be a game of indiscipline and special teams, which the Hawks actually won. Perhaps the excitement gets to the players too. And the ice didn’t help, but the Hawks should be used to that. Still, you can’t be blowing three-goal leads at home, can you? Let’s try and clean this one up, if we can. 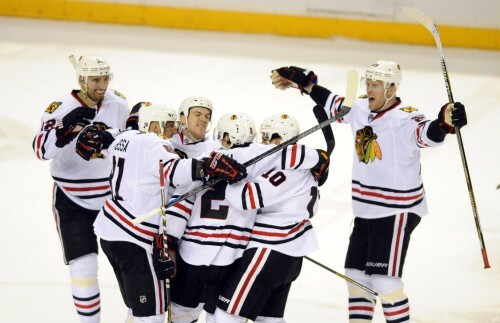 -The Hawks did most of the things we hoped they would tonight as strange as that sounds. Their breakouts, at least everyone was where they were supposed to be. They got beat by some bad bounces and rolling pucks, but no forwards were cheating or fleeing, at least for the most part. They don’t have to bat 1.000 on this of course, but they came close. Now if they can just tighten up the passing with everyone where they’re supposed to be, then the Hawks will be in serious business. -Ok, so the goalies. Crow could only be blamed for the 2nd goal, and that puck strangely stuck on the wall and Keith can’t wait for the puck to come to him when he sees that Crow was in trouble (and Rozsival wasn’t even in the screen). Keith has to be above Stalberg there. That said, the goalie switch was warranted if only to wake up the team, which it seemed to as they only gave up four shots in the second frame and tied the game. Darling was fantastic after that and deserves every plaudit he gets. However, you don’t toss the Jennings Trophy winner (for the 2nd time) overboard after one bad period in the first game. Crow has earned the right to bounce back. And he will, and you hold me to that. -As for the other end, Rinne never looked comfortable tonight, and I’m not sure I’ve ever seen him less square to shooters than tonight. That’s why rebounds were everywhere and it looked like he was stabbing at everything. Toews’s goal simply can’t happen if you’re in yellow, and the Hawks could have had more. -The only foot Seth Jones put wrong tonight was right before the winner when Saad and Toews were able to get to him after a faceoff, which the 4th line forced with an icing. -Speaking of that 4th line, after watching the Hawks go without one last year it’s refreshing to see one that’s effective and that Q trusts. 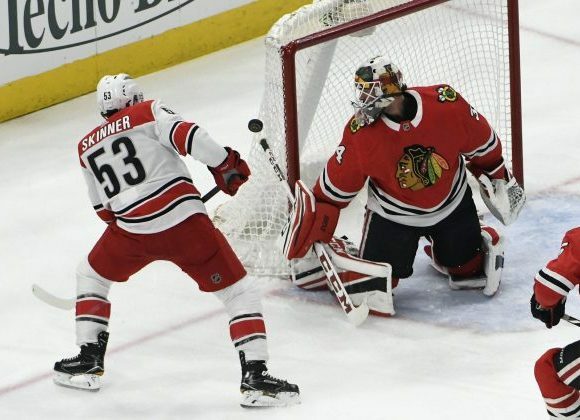 Their only point came 4-on-4 with Teuvo’s diseased pass to Hammer, and they were underwater in possession on the night, but they had their moments. And Nashville’s 4th line was far worse, and this is what should separate the Hawks. -Kimmo +11.9 in Corsi-adjusted tonight. His penalty wasn’t good, and he was spotted, but when he was out there he looked as lively as he has and with some timely pinches. I don’t think the Preds have the size to make him truly squirm, and this should get better as it goes along. -38% on faceoffs is kind of an issue, as this team isn’t as geared to get the puck back as past iterations. Vermette would help with this, unless the whispers of a wrist injury are true. Still, he’s got the track record. -I didn’t think it would happen, but the PK has struggled without Ben Smith. It’s been everyone on the kill, and tonight it was Nordstrom losing his footing on the boards resulting in a weak clearance. It feels like the Hawks are getting beat when they miss clearances, but I’d have to go back and look at it all and I’m not going to. -I actually thought Marian Hossa looked a tad lethargic all night, even beside his penalty, but he’s earned a pass if that’s even true. -While a lot will be made of the minutes load of the top four, Keith playing 40 out of 87 minutes isn’t actually so ridiculous. It’s harder on the road, but Q did a nice job after the first period of spotting 32 and 44, if the horse wasn’t already out of the barn. And by horse I mean Colin Wilson. I can’t do no more.